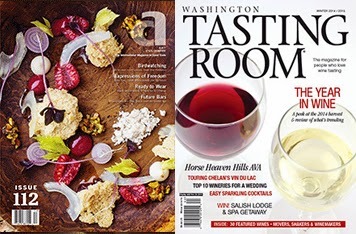 The Winter 2014/2015 issue of Washington Tasting Room has a cover article titled 'The Year in Wine: A peak at the 2014 harvest & review of what's trending." See a list of newsstand locations. Issue 112 of Art Culinaire has an article titled 'A winemaker's tale' on Kyle MacLachlan's Pursued by Bear. See a list of local retailers. Finally, the book Walla Walla Winery Dogs has a short piece on the Walla Walla Valley. Look for it at area tasting rooms. See a list of other publications, most with weblinks, here.